Product label information matters. Specifically — what you choose to put (or not put) on your label could be the determining factor on whether or not a customer chooses to buy your product over your competitor’s. According to a Trace One Network study, 40% of consumers said they’d be willing to pay for more a product if the product label listed more detailed ingredient and allegory information. The Trace One Network, a private brand product lifecycle management (PLM) solutions and transparency software, released the results of its “Global Consumer Food Safety and Quality” study. The study revealed that only 12% of consumers said they “wholeheartedly” trust the safety of the brands they consume. “In fact, more than a quarter (27 percent) of consumers do not even trust the information on food product labels,” the Trace One Network states. •Of those consumers who do not buy private brands, 25 percent named fewer choices and 24 percent cited lower food quality as their top reasons. While your brand may not be a private label brand, there’s still a lot you can learn from these survey results. Consumers want more information about the product they’re buying. They want to know the ingredients in the products they’re purchasing, they want to know what allergy interactions, they don’t want to read false health claims, they want to know where their products are made and where the products are sourced. When designing your product label, keep it honest and you will build a brand consumers trust! When you think of social media platforms, you might think of Instagram, Facebook and Twitter, but, you might be forgetting one of the most powerful marketing tools– YouTube. If you’re not marketing your product on YouTube, you’re missing out on a free, easy way to tell the world about your product. 1. It’s FREE! Marketing on YouTube is free and easy! You don’t have to be a professional videographer to create a short commercial or video clip about your product– a cell phone video will do in a pinch. Once you’ve uploaded the video, you can share it on your other social media platforms. 2. Sharing a video about your product on YouTube allows you to create a voice and tone for your product. Make a fun and quirky video, or make a serious one, but use YouTube to educate the world about your product. 3. YouTube now allows cards and links to your website. YouTube had made it easy to add clickable links to your videos. You can now embed links to your website from your YouTube videos. This is a great way to bring traffic to your site. 4.Traffic. More than 124 million people visit YouTube each month. Further, YouTube is one of the most popular apps that are downloaded. Did we mention it’s FREE to upload your videos to YouTube? 5. Share and Embed capabilities. You can easily share your YouTube videos to your other social media platforms as well as your website. YouTube makes it easy to share and embed your videos. If you’re not taking advantage of all that YouTube has to offer, you’re missing out on a prime marketing opportunity. What are you waiting for, create a video and get started today! You had an idea, you created a product and a business. You’ve got a package, a logo and a label. Now it’s time to get your product in front of customers and on store shelves. What next? Gaining valuable shelf real estate can be a battle but doing so can help rocket sales. 1. Become a reputable company. Build a website and a social media presence. Make sure your product label meets federal guidelines. 2. Conduct and document consumer feedback and testimonials. Survey customers about your product. Ask them what stores they’d like to see your product stocked, ask them how often they’re likely to purchase your product, etc. Tabulate survey responses. Create a spreadsheet of the customer feedback for grocers to read. 3. Offer your item on consignment. Ask for shelf space but don’t require the store to purchase the product. One the items have sold, the store pays you a percentage of the profits. 4. Ask to do a one-day promotion, trunk show or demonstration of your product. Set up a table, hand out samples, business cards and other collateral. 5. Ask your customers to request your product at their favorite stores. 6. “Donate” a small sample of your products to the store for the store to sell. This offers a no-risk option of stocking your product. 7. Ask the store if they’re willing to stock a small number of your products with a pre-sale or order option. 8. Build a robust wholesale process. Make it easy for stores to order your product. Deliver your product on-time, every time. 9. Dedicate a “Where to Buy” section on your website. Let your customers know where they can find your product in stores and encourage them to purchase from your vendors. This will help promote the store and shows you support your vendors. 10. Make sure your product, logo and label is professional. Invest in a label dispenser to ensure you have a proper aligned, even label. There are so many decisions to make when choosing a font your your label. It’s important to decide what colors you want to use, what information you want on your label, but choosing the right font is equally important and shouldn’t be an afterthought. There are so many fonts to choose from, that the process of choosing the right font can be overwhelming. When branding your product, you should choose a few fonts and stick with them on all of your products, collateral and website. With that in mind, before choosing a font, make sure that it’s also a web font. Design tip: Never, ever use Comic Sans. 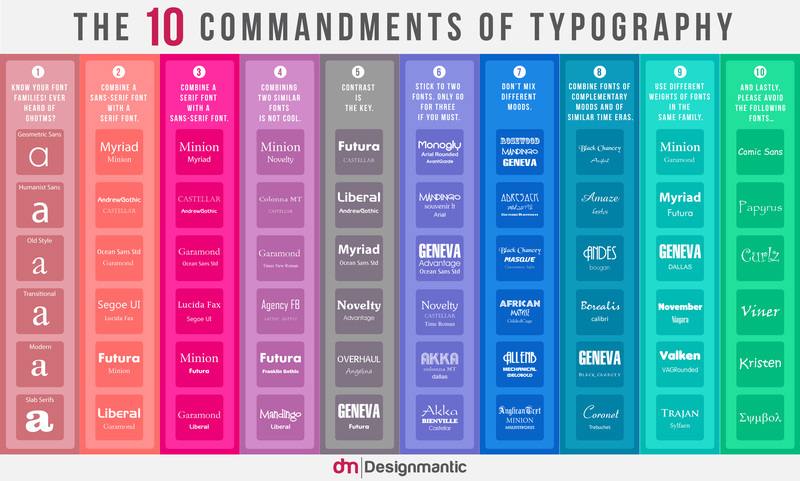 Check out this great infographic from Designmatic on The 10 Commandments of Choosing a Font. Labels tell the customer a lot about a product and your brand. Whether you’re a new company just starting out, or you’re looking to expand your product line, we have some tips that can help your product stand out on the shelves. Are your labels perfectly aligned? Are they crooked and off-center? Consistently placed, centered and crisp labels make your product look more professional and sophisticated. Don’t apply your labels by hand.- This can sometimes lead to human error and sloppy labels and it can be very time consuming. Invest in a label dispenser or label dispensing machine. Label dispensers apply labels perfectly every time and they ensure that your labels are centered, consistent, crisp and professional-looking. Studies have shown that colors subconsciously evoke emotion and they play an important role in your product standing out on the shelf, as well as communicating information about the product you’re selling. When you design your logo or your labels, be conscious of what your brand stands for and what you want to communicate to your customers. Red signifies active, emotion, passion, trust, loyalty, intensity, and aggression. Blue symbolizes comfort, faith, conservativeness, understanding, clarity, confidence, calm and trust. Yellow means joy, alive, energy, fresh. Green symbolizes calm, relaxation, trust, peacefulness, and hope. Glamour, power, nostalgia, romance, introspective. Love, sweetness, warmth, sexuality, nurture. Check out this beautiful infographic created by Ruby Media for Finances Online. Does Your Product Stand Out On Shelves? One of the keys to selling your product is making it enticing enough to shoppers. You could have the best product of its kind but that won’t help you if it is blending in with its surroundings. The first goal of any packaging design or label is to make that product stand out on shelves. Before slapping any label on a product, the design needs to be carefully thought through. One of the first objectives to designing a label is to understand your audience. You’re not selling to everyone. Target market analysis should’ve been done prior to creating your product but now is the time to do it if you still haven’t. Go to the store and observe how your audience shops for their goods. You’ll be able to identify what types of labeling catches their eye and how they interact with products. Knowing this information provides you with a starting point that is in the right direction. Shelves are littered with hundreds if not thousands of products, especially in grocery stores. With so much visual stimulus it could be a challenge to make your product visible to consumers. A few ways you can differentiate your product are through shape, color, and other graphical elements. If your product allows for it, you can use packaging that has a unique shape to it. Try something that your competitors are not doing. The color of your product’s packaging and labels should be well thought out. There are a handful of studies that show different colors evoke different emotions from people. For example bright reds and oranges illicit feelings of energy. Blues often have more of a soothing appeal. Graphical elements such as fonts or images will also help to differentiate your product from the masses. Choose something unique, memorable, and distinct from your competitors. Imagery can often engage your customers and move them from just visually seeing the product to actually picking it up. Finally your labeling needs to convey clear, meaningful messaging. This is where you want to provide your product’s value proposition. In other words, why should the consumer choose your product? Your window of communication with your potential customer is brief. You’ll be lucky to grab a few seconds of their attention, so the copy that you choose for your labeling must be concise yet compelling. Without effective marketing it will be extremely difficult for you to get your beauty product off the ground. There are almost infinite competitors in the marketplace and they are vying for a piece of the beauty industry pie. Launching your product can pose a lot of challenges, but there are a few tips that can give you a leg up on competition. What makes your product different? The beauty market is extremely saturated with almost every kind of product you can imagine. Take a hard look at your product and determine how it is better than the next person’s. Maybe your product is made from all organic ingredients or maybe it is for people with sensitive skin. Find all of these unique selling points and use them to your advantage. Marketing your product is not going to start with a national TV commercial airing during “Scandal”. The best place to start your marketing efforts is with your friends, family, and local community. Setup digital profiles so that you local fans can connect with you and start providing feedback and advocacy. Referrals and word of mouth from your personal community can translate into hundreds of new customers. Getting your product into peoples’ hands is paramount to your marketing success. This is especially true with the beauty product industry. It is hard to convince someone that your lotion will make their hands softs if they haven’t actually used it. It is a lot easier for a person to imagine your mascara on them if it is actually on their face. Attending craft fairs, farmers markets, and other community events will help you to get your products in peoples’ hands.